The Mapleview Mennonite meetinghouse was built in 1982 after neighboring congregations outgrew their church homes. It included about 28 families when it first started. Ralph Reibel, the first deacon, was ordained by lot in 1983. Emerson Bauman, who had been ordained the Martin Mennonite meetinghouse in 1959, served as the first minister. He had farmed on the edge of the city of Waterloo until his farm was sold. He moved north to the Arthur area to a farm in 1981, and began serving Maple View in June 1983. By 1998 the congregation at Maple View had grown to 60 or more families. The meetinghouse was not longer big enough. The Markham Waterloo Mennonite Conference has the practice of holding services in the home congregation approximately half the time (2 or 3 times a month). On Sundays without a home service, the congregational families can attend any of the other meetinghouses that are open. In this way all members can hear all the ministers and deacons in the conference, and can visit with all the other conference members. This practice made it possible to divide Maple View into two congregations -- Maple View North and Maple View South -- at the beginning of 1999. Jason Weber was ordained as minister for Maple View South on 26 May 1999. At age 25 he was the youngest of the six candidates. Ralph Riebel, who lived on the south side, served as deacon, while Emerson Bauman served the North congregation. At the time of the division, Maple View South included about thirty families. 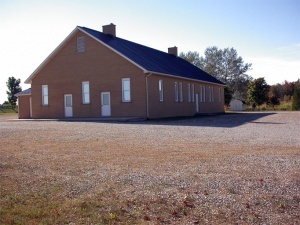 Martin, Murrel R. "Maple View South Mennonite Meetinghouse (Alma, Ontario, Canada)." Global Anabaptist Mennonite Encyclopedia Online. January 2004. Web. 22 Apr 2019. http://gameo.org/index.php?title=Maple_View_South_Mennonite_Meetinghouse_(Alma,_Ontario,_Canada)&oldid=115602. Martin, Murrel R. (January 2004). Maple View South Mennonite Meetinghouse (Alma, Ontario, Canada). Global Anabaptist Mennonite Encyclopedia Online. Retrieved 22 April 2019, from http://gameo.org/index.php?title=Maple_View_South_Mennonite_Meetinghouse_(Alma,_Ontario,_Canada)&oldid=115602. This page was last modified on 14 March 2014, at 14:05.